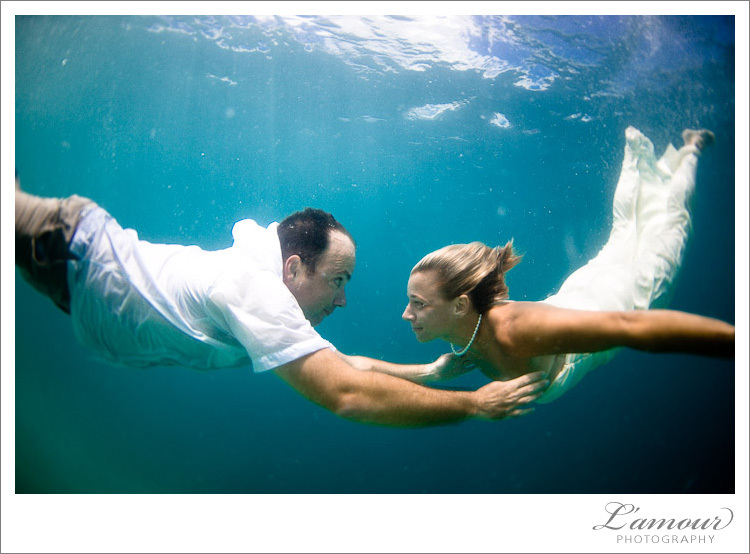 Trash the dress photos are definitely a favorite of ours. 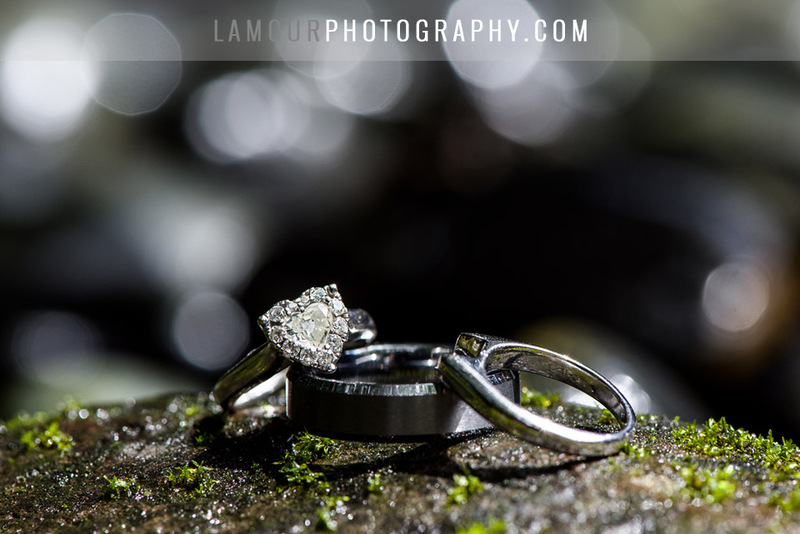 These post wedding photo sessions are more relaxing and with limitless possibilities compared to wedding portraits during the hustle and bustle of the big day. 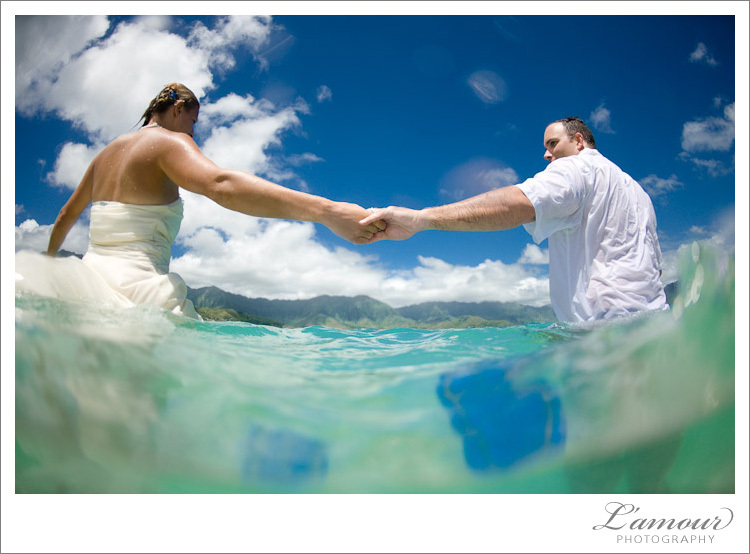 We also love trash the dress sessions because we get to travel to fun locations, like this beautiful spot out on the sandbar on Oahu. We get a chance to really hang out with our couples and have a good time getting creative and letting them be themselves on camera. 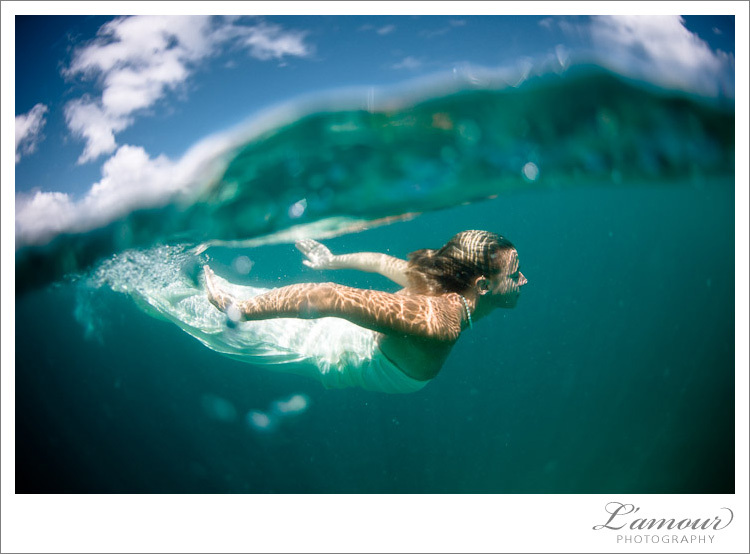 This couple was the perfect fit for a trash the dress session at the sandbar. They love water and were great at being playful in front of the camera. 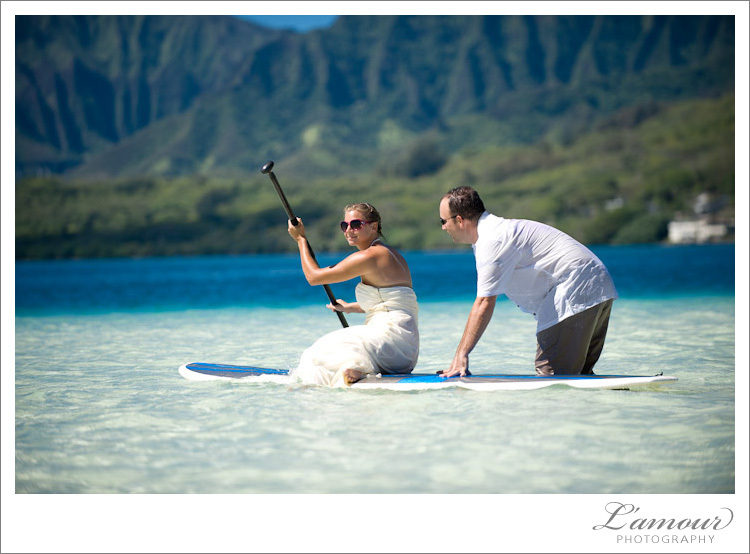 They even brought out their own stand up surfboards for the trash the dress photos. 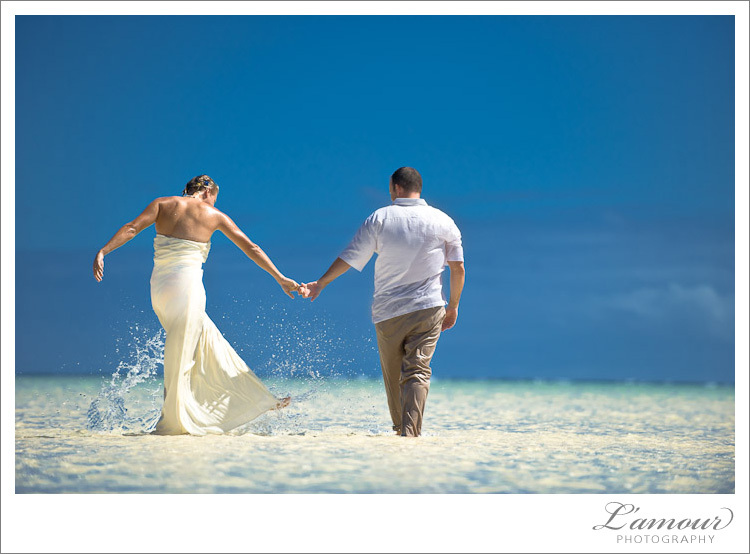 The boards came in handy too as we trekked all of our gear out to this tiny strip of sand out in the ocean! 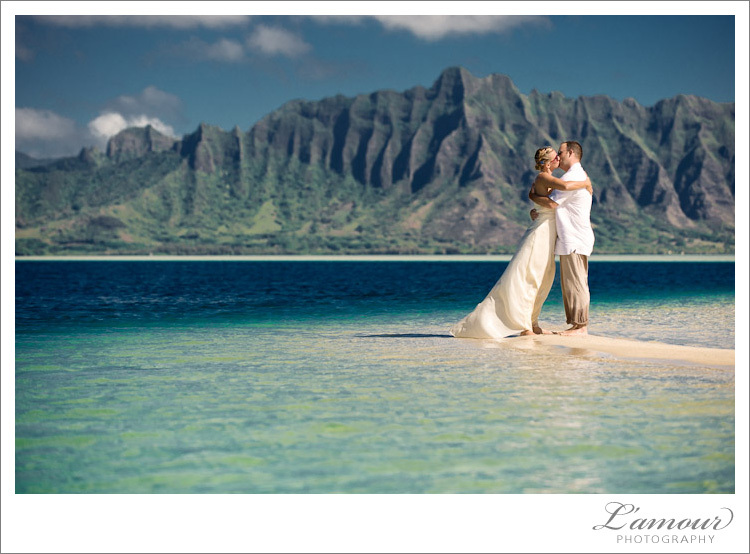 This Hawaii destination wedding bride and groom from California had the great idea to have their wedding ceremony and reception at a private estate in Kaneohe on the island of Oahu, over looking Kaneohe Bay. 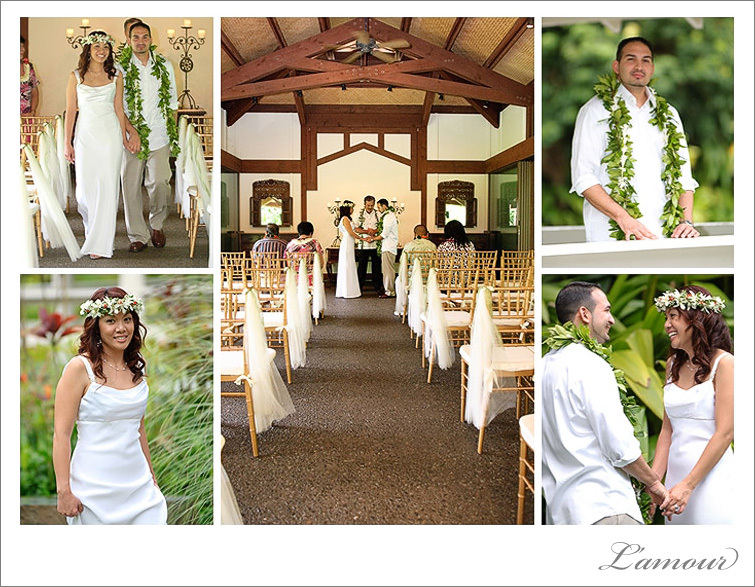 Private estates can be great wedding venues for smaller Hawaii weddings. 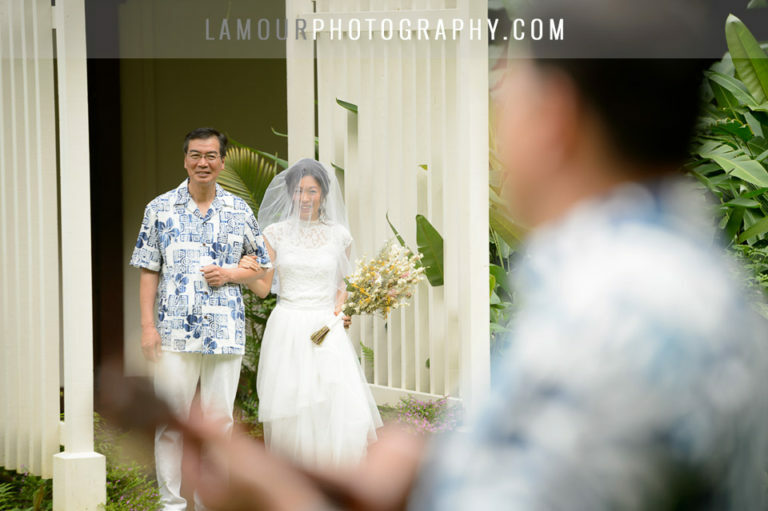 In some cases, the houses may be rented out to the couple and their guests in the days surrounding the wedding. 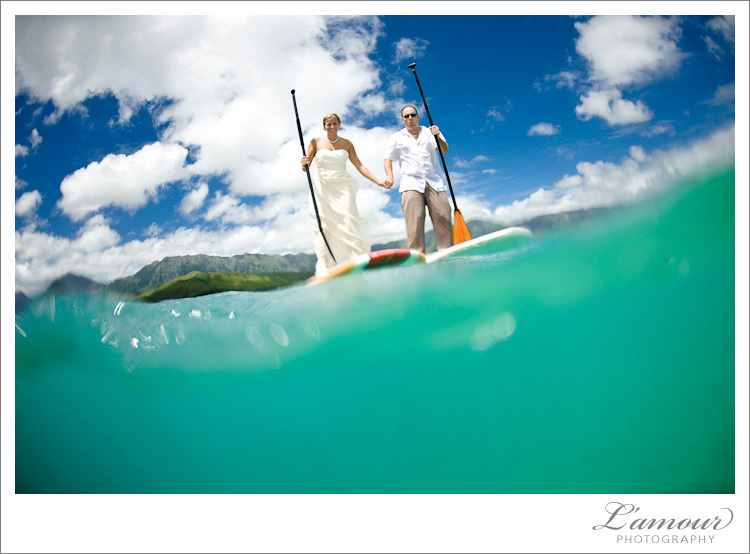 That can really make a difference to your guests’ and your families’ experience while in Hawaii for your wedding. No need to deal with hotels, parking issues, or scheduling to meet up with people. To top that, you don’t have to worry about your guests showing up late to your wedding since they will already be there! 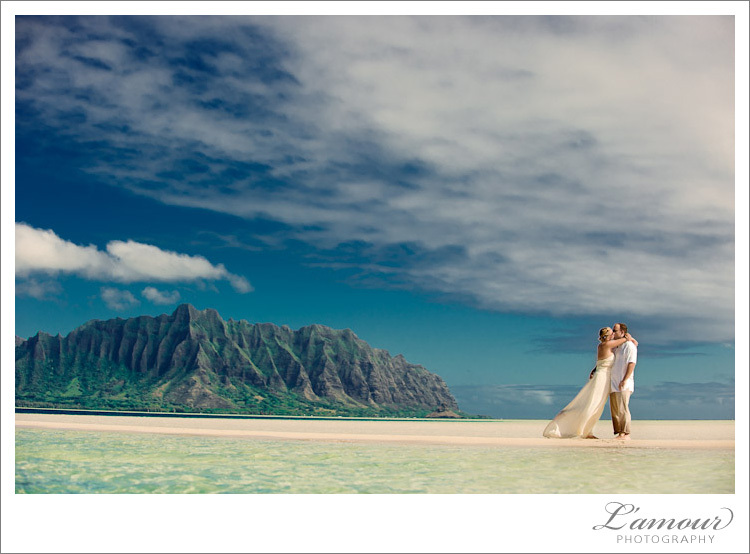 This particular private estate had a gorgeous view of Kaneohe Bay as well as a manicured garden with a heart-shaped bush, an inviting pool (so inviting, that the best man jumped right in after doing his speech during the reception!). 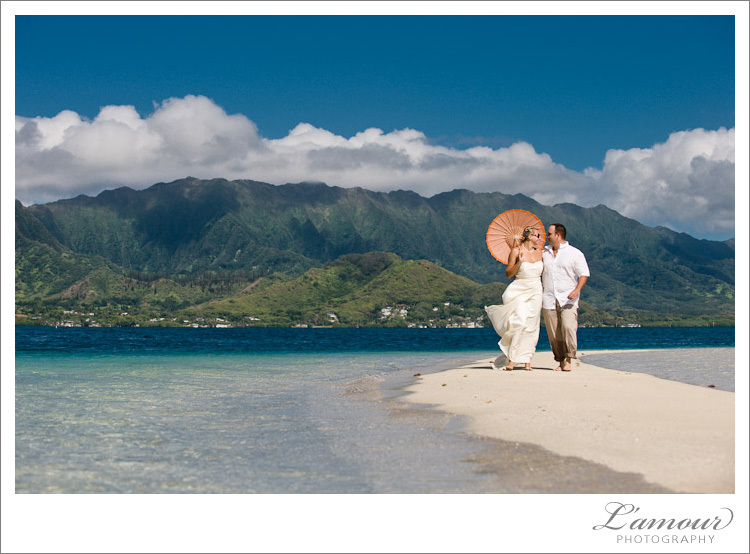 Check out more Hawaii Wedding articles on our blog to see other wonderful Oahu wedding venues and private estates! Congratulations to Sue and Manny!!! 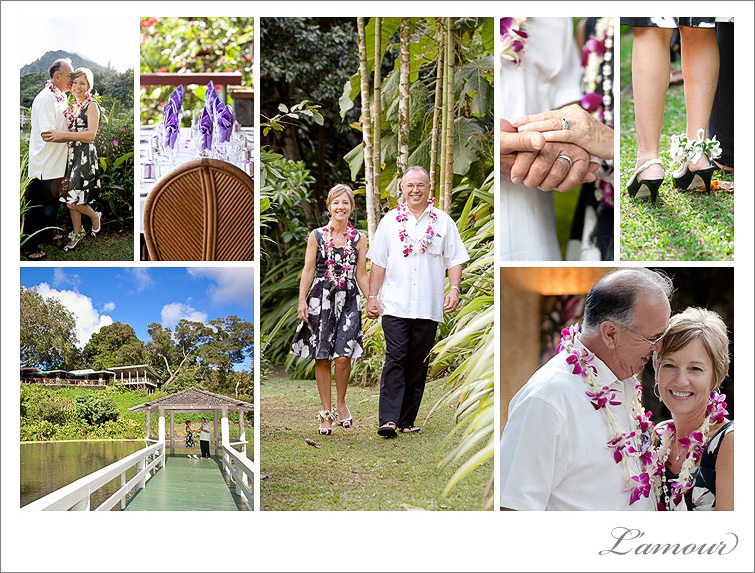 This happy couple had a short Hawaiian beach wedding and then headed over to our neck of the woods, Kaneohe, to Haiku Gardens for an intimate wedding reception. 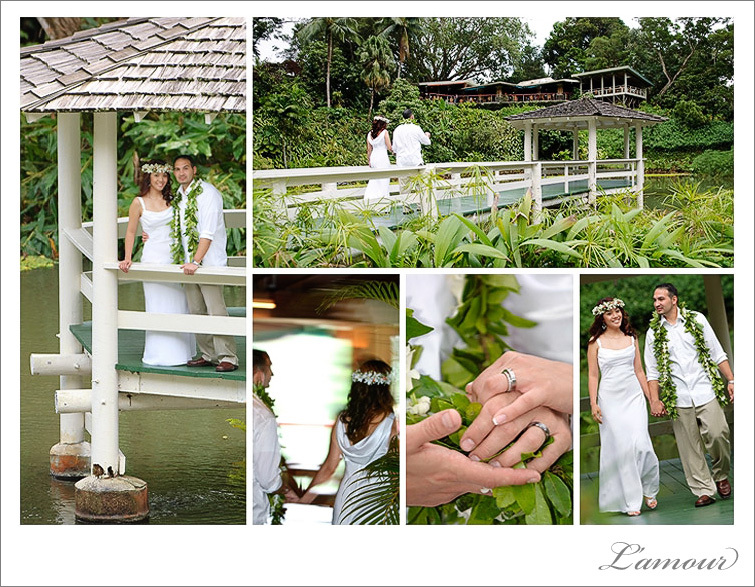 Eric and I are always happy to head over to Haiku Garden and Haleiwa Joe’s for weddings, dinner, or just some pupus and cocktails at happy hour! This wedding party was super nice and the happy bride and groom were so in love and enthralled with each other that we hardly had to suggest any poses, they just naturally looked great interacting with each other. That always is a blessing as I prefer more photojournalistic shots of couples just being in love and being themselves! Not only were Sue and Manny super cute, I loved their style. Sues shoes were reminiscent of my own wedding shoes for our civil ceremony last year. You gotta love a girl who wears black and white wedding shoes!